In a small Oklahoma town, one star linebacker must decide what kind of man he wants to be—both on and off the field. Welcome to Kennisaw—where Friday night high school football ranks right up there with God and country, and sometimes even comes in first. This year, the Kennisaw Knights are going for their fifth straight undefeated season, and if they succeed, they’ll be more than the best high school team in the eastern Oklahoma hill country—they’ll be legends. But the Knights’ legacy is a heavy weight to carry for Hampton, linebacker and star of the team. On the field, he’s so in control you’d think he was able to stop time. But his life off the field is a different story. His father walked out on him and his mom years ago, and now his mom has a new boyfriend every week. He’s drawn to a smart, quirky girl at school—the type a star athlete just isn’t supposed to associate with. And meanwhile, his best friend and teammate Blaine—the true friend who first introduced Hampton to football back when he had nothing else—is becoming uncomfortably competitive, and he’s demanding Hampton’s loyalty even as Hampton thinks he’s going too far. This unforgettable novel is the story of a boy whose choices will decide the kind of man he becomes, and raises powerful questions about sportsmanship, loyalty, and the deceptiveness of legends. 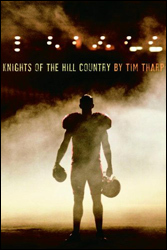 Knights of the Hill Country has been named to several state reading lists and to the American Library Association’s best books of the year list.